The Asian Human Rights Commission (AHRC) wishes to draw attention to the situation in Thailand on this momentous day, December 10, which is observed as Human Rights Day. Unfortunately, in Thailand, the day will be eclipsed by the Military regime that is in power since May 2014, when it overthrew the last elected government. It is the rudimentary nature of the Thai legal system, and a weak Constitutional Court that has led to 13 military coups in Thailand since 1932. Despite 16 new constitutions having been promulgated since the first coup and the first Constitution, Thailand could not prevent a Military dictatorship from declaring and “taking over administration of the country” yet again. Soon after the 13th successful Military coup, the National Council for Peace and Order (NCPO) replaced the country’s Judiciary with Military courts, for all practical purposes concerning fundamental human rights and freedoms. Three NCPO announcements: No. 37/2014, No. 38/2014, and No. 50/2014, expanded powers, and retained Military court jurisdiction over civilians, in cases of lèse majesté, national security crimes, weapons offences, and violations of NCPO orders. The result of these three measures has been to extend the control of the Military judicial system to civilians and civilian cases. According to information received from the Judge Advocate General’s Department (JAG) on 12 July 2016, 1,811 civilians have been tried in the Military court in 1,546 cases from 22 May 2014 to 31 May 2016. 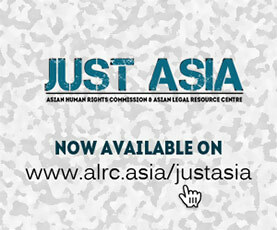 The AHRC has found that the Military courts do not accord the same rights as Thailand’s civilian courts and violate internationally protected fair trial rights, especially rights to fair and public hearing by a competent, impartial, and independent tribunal, and the rights to legal representation. On 12 September 2016, the NCPO also issued the NCPO Order No. 55/2016, under Article 44 of the Interim Constitution; it states that all cases involving offences covered under NCPO Order No. 37/2014, No. 38/2014, and No. 50/2014, will no longer be tried in Military courts. However, this Order does not cover cases initiated before the Order was issued; it also fails to cover cases under Article 12 of the NCPO Order No. 3/2015, the junta’s public gathering ban, and the NCPO Order No. 13/2016, which gives Military officers extrajudicial power. Therefore, crimes involving these laws still have to be tried in Military court. For example, Ms. Sirikan Charoensiri, human rights lawyer and legal and documentation officer at Thai Lawyers for Human Rights (TLHR), is now facing accusations of sedition under Section 116 of the Thai Criminal Code, as well as violation of Article 12 of the NCPO Order No. 3/2015. The inquiry officer informed Ms. Sirikan that she was charged with being an accomplice in the coup commemoration organized by the New Democracy Movement (NDM) at the Democracy Monument on 25 June 2015. These charges stemmed from Ms. Charoensiri not letting her car be searched and for her carrying the activists’ belongings. If indicted, she will be tried in Military Court. The NCPO also issued a series of their orders and announcements and imposed Article 44 of the interim constitution, according to which General Prayuth Chan-ocha, as the junta leader and Prime Minister, has absolute power to give any order deemed necessary to “strengthen public unity and harmony” or to prevent any act that undermines public peace. As a result, the status of the Order issued under the power of Article 44 is equal to an act passed by the Legislature. To illustrate, the NCPO Order No. 3/2015, issued under the authority of Article 44, permits boundless exercise of power and also inserts Military officials into the judicial process and provides them with the authority to carry out investigations along with the police. In addition, the Order gives authority to Military officials to detain individuals for up to seven days. During this seven-day period of detention, detainees do not have the right to meet with a lawyer or contact their relatives, and the Military officials further refuse to make the locations of places of detention public. With two years having passed, 7 August 2016, was scheduled for the constitutional referendum by the Thai Military government and the NCPO. Providing the conditions for free and open political communication was the basic element of ensuring fair and democratic referendum processes. It is during times of political change that the right to freedom of expression is most essential, ensuring that a well-informed and empowered public was free to exercise its civil and political rights. However, under Thai law, the Constitutional Referendum Act B.E. 2559’s Section 61 paragraph two and its implementation, along with NCPO Order No.3/2015, have shown contradictory results. It intends to restrict the rights of people, who need to discuss and to critically evaluate decisions about their country. As of August 2016, 165 people had been prosecuted for publicly opposing the draft constitution— many of them from the capital, Bangkok. In addition, when the constitutional referendum passed, rights groups still expected the Military government and the NCPO would allow people to exercise their rights. However, the AHRC has witnessed how the right to freedom of expression and opinion has been muzzled, with critics having to eventually face lèse majesté or Section 112 under the Thai Criminal Code. The AHRC would like to point out the permanent case of a 71-year-old writer arrested for the third time under lèse majesté law. On 15 November 2016, police officers from Chanasongkram Police Station, Bangkok, arrested a writer known by his penname Bundit Aneeya from his house in Nong Khaem District. At the Police Station, the police informed Bundit Aneeya that he was accused of committing an offence under Section 112 of the Thai Criminal Code for allegedly making comments about the Thai monarchy at a political seminar about the junta-sponsored constitution drafting process, on 12 November 2016. After his lawyer from Thai Lawyers for Human Rights filed a second petition asking for bail from the Military court, he was released on 400,000 bath (around $12,270 USD). He is one of the few lèse majesté suspects granted bail by a Military court. This trial is still ongoing. The AHRC is deeply concerned that the Thai Military government and the NCPO are not serious about abolishing the Military courts and are tending towards continuing to restrict the people’s rights, in particular freedom of expression and freedom of assembly, even more so than in the past. 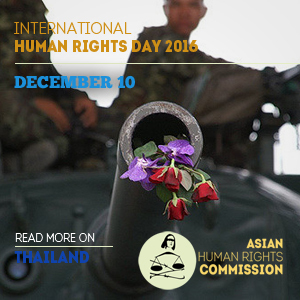 On Human Rights Day, 2016, the AHRC again calls for the NCPO to revoke Article 44 of the Interim Constitution and the NCPO orders and announcements that place civilians in Military courts, and to end all violations and harassment of ordinary people. In addition, the NCPO and Military government must arrange for elections and peaceful transfer of power to a civilian government, i.e. back to the people of Thailand.